Update Monday Jan 18th: Another update in an attempt to keep the links valid. Update Friday Jan 15th: The team has gone back and updated some of the mapping links so check them out at the bottom of this post. Dead links have been removed and new ones added. Keep in mind much of this is fluid so sorry if the links don’t work when you try them out. On Tuesday, January 12 a 7.0 magnitude earthquake struck about 10 miles southwest of the capital of Port-au-Prince, Haiti. The earthquake was the worst in the region in more than 200 years. With many poor residents living in tin-roof shacks that sit precariously on steep ravines and with much of the construction in Port-au-Prince and elsewhere in the country of questionable quality, the expectation was that the quake caused major damage to buildings and significant loss of life, according to The New York Times. ITHACA - Information Technology for Humanitarian Assistance, Cooperation and Action Maps Archive http://www.ithaca.polito.it/maps.php Damage assessment maps based on satellite image visual interpretation. ITHACA is a non-profit association which is located in the Politecnico of Torino campus that partners with the UN World Food Programme (WFP). 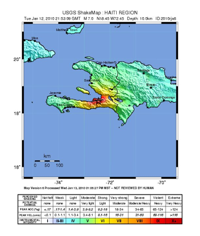 The National Geospatial-Intelligence Agency Haiti Earthquake Crisis Relief Public Site https://www.geoint-online.net/community/HaitiCrisisResponse/default.aspx The National Geospatial-Intelligence Agency (NGA) is supporting the State Department, the U.S. Agency for International Development, the U.S. Southern Command and the Department of Homeland Security (DHS) with analysis, unclassified commercial satellite imagery and geospatial intelligence products of the Haitian areas devastated by the recent earthquake.